Though not official yet, there are strong rumours out there right now that UFC Welterweight Champion Tyron Woodley’s next title defense will come at UFC 219 at the end of December, opposite fan favorite Nate Diaz. Both fighters have entered fight camps, and it’s assumed that the final details of the bout agreement are being worked on. Though the UFC added Cyborg vs. Holm to the card, UFC 219 could still use another big fight, and no doubt the UFC thinks Diaz vs. Woodley is a big fight. But this fight really doesn’t make sense, and fans can see right through it, based on social media perception. They don't believe Diaz deserves a title matchup because he hasn’t won a fight in nearly two years, not since his upset submission win over Conor McGregor in March 2016. He isn’t even ranked, and he lost his last fight. 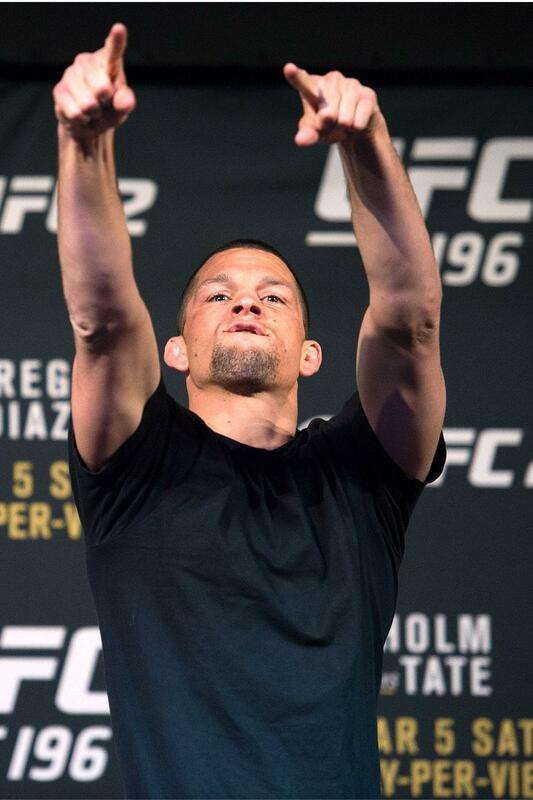 There are so many other welterweights far more deserving of title shots, but with Diaz coming off of back-to-back monster pay-per-view numbers against McGregor, the UFC figures that going with a matchup that makes no sense as far as the rankings go, and also goes against the integrity of the title, will be worth booking due to what they believe will be big PPV numbers. Will the fight really be as big as the UFC is hoping, though? While Woodley is a fairly dominant champion at 170, he’s never really been a PPV draw, and most fans don’t view him as super exciting. He has the potential to flip the switch with a few KOs, but he has “played it safe” in recent fights, and fans haven’t responded positivity to his performances. There’s still intrigue anytime Woodley fights, but after his last few fights, you can’t blame fans if they aren’t running to buy the PPV. Diaz, on the other hand, is always extremely exciting, and fans enjoy watching him compete, but other than in the McGregor PPVs he has never been a true PPV draw either. It’s possible that the fight will do well on PPV because his profile got raised by beating McGregor, but that may not translate to as many PPV sales as the UFC is hoping. If I had to guess, the UFC wants this fight to do a million PPV buys, but I think 500,000, tops, and likely even less than that. Those two McGregor fights have no doubt boosted Diaz’ stock, but I’m not convinced just yet that he’s a box-office superstar. There’s also the matter of this fight just not making sense at 170. On paper, Woodley vs. Diaz holds some slight intrigue if Diaz can get his boxing game going, but overall it doesn’t look like too competitive of a matchup. 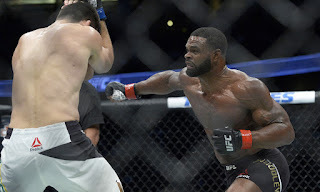 Woodley has far superior wrestling, and considering Diaz is a natural lightweight, Woodley should be able to take him down at will and hold him there while avoiding Diaz’ submission attempts. Diaz has the better hands, but Woodley possesses dangerous KO power and also has a solid leg kicking game, something with Diaz is susceptible to. 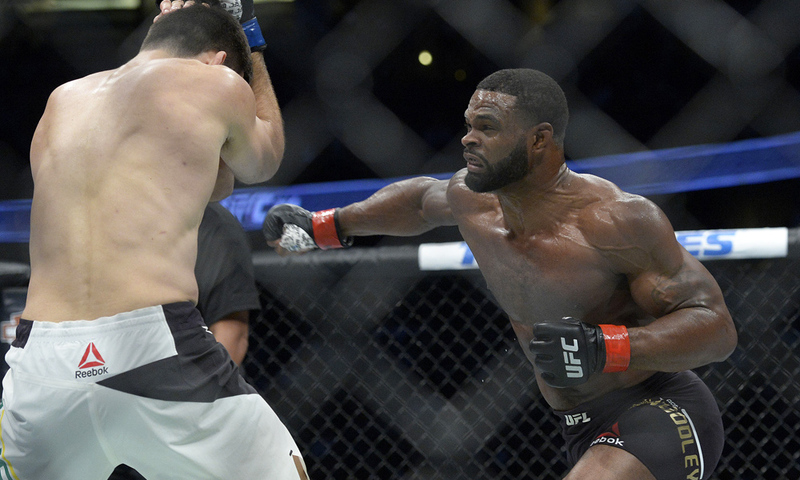 Diaz has better cardio, which could become an X-factor, but overall, all signs are pointing to Woodley winning this fight, and not surprisingly, the online sports betting opening odds pegged him around a 3-to-1 favorite to win the fight. It’s not a terrible fight by any means, but Woodley vs. Diaz really doesn’t make sense. Woodley should be fighting someone in the welterweight top five, and Diaz is only maybe getting this opportunity because UFC 219 could use another big fight. Neither guy has truly proven he is a huge PPV draw, but the UFC is no doubt expecting them to do big numbers together, despite the early fan reaction being negative. To be fair though, a few press conferences and social media exchanges could change things, and most fans thought very similarly of Michael Bisping vs. Georges St-Pierre, and that turned out to be a great fight. We’ll see what happens, and maybe the PPV numbers will be better than expected, but there’s a good chance Woodley vs. Diaz won't be an exciting fight and won’t do well at the box office. We’ll know whether or not it was worth it for the UFC once we see the fight and the final numbers, but right now it’s not looking so good.